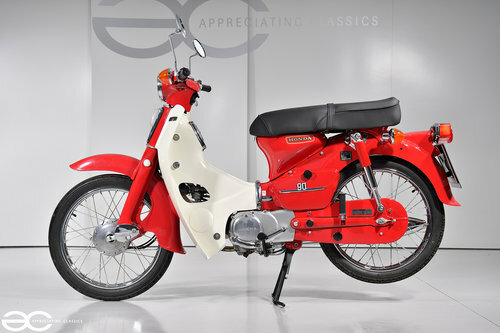 Here we are very proud to offer a truly stunning example of a 1979 Honda C90. Immaculate examples of this model and year are becoming very hard to find now, with collectors snapping them up as soon as they come to market. Almost 40 years old, this example you see here, is in full beautiful show standard condition. 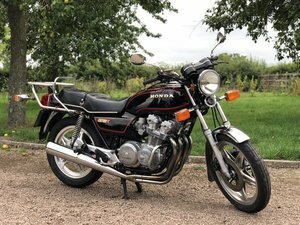 Having had a thorough nut and bolt refresh to the highest of standards, using either fully refreshed parts or new old stock replacements at great cost, we are sure this is one of the best examples available and is ready for the discerning collector or somebody looking to relive there youth with a smile. 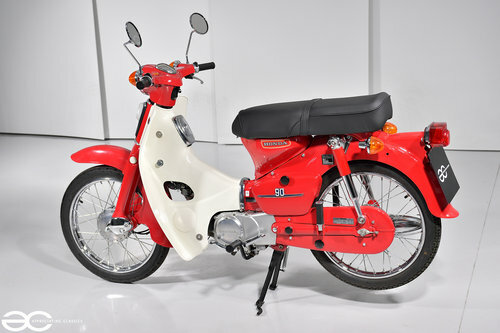 The famous Honda C90, speak to almost anybody, be it a motorcycle enthusiast or not, and chances are they are familiar with the Honda C90. 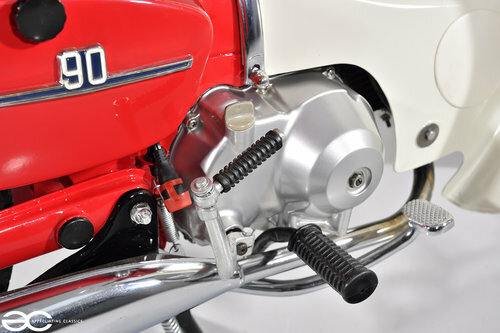 When the original C100 Super Cub was released in 1958 it was a major revelation. Bikes at the time were notoriously unreliable and difficult to ride. 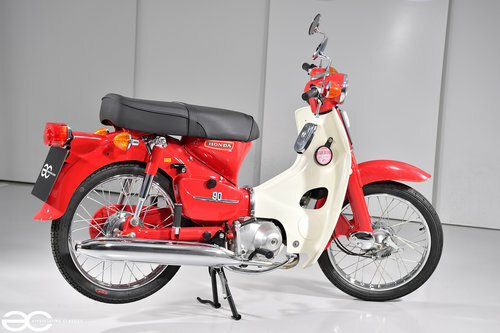 Honda changed that, and the C90 which came later on is regarded as the best. Extraordinarily reliable, fantastic fuel economy and very easy to ride. All of this meant that sales were simply fantastic, and everybody had a C90, from your Gran to pop round the corner to the shop, to your 13 year old child and his friends for having fun on the empty field over the road. Now a collectors piece, particularly in the condition you see here, a nostalgic ornament, or a bike to be taken to shows for others to admire and reminisce, or even an example to use on the odd occasion, this C90 will take you back through the years with a big grin! 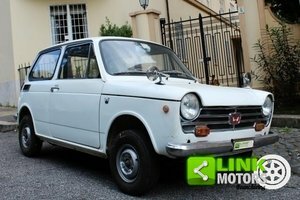 As can clearly be seen by the pictures, the frame and bodywork are in great order. A nice deep gloss finish is present across the frame work and panels, with badges being in superb condition. The bike has had a no expense spared nut & bolt refresh, with some new old stock items having been used to make it simply the best. All bodywork is without damage, and all lights could pass as being near. The chrome is all beautiful, with none of the usual ‘patina’ often seen on such bikes. 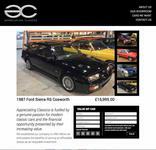 A truly beautiful example ready for any discerning collector. As with the rest of the bike, all trims are of course in very good condition. Handle bar grips, foot pegs, mirrors, switch gears are all superb. None of the usual marks or scuffs to the grips, or indeed the mirrors, this example really is among the best and not an ‘average’ example dressed up as a ‘show bike’. 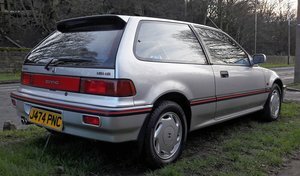 Famed for its reliability, this example has benefited from a refresh as part of the overhaul and runs exactly as you would expect. 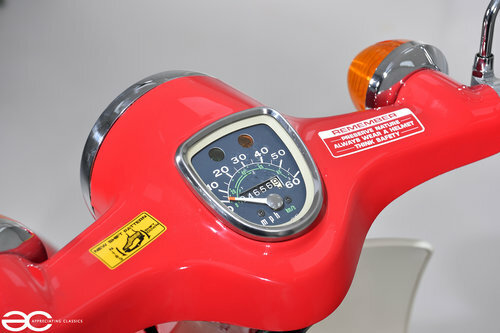 Starting with ease, and running smoothly from start up, the gears are a pleasure to operate and the bike rides great. Of course the running gear is all in superb condition, having had all parts overhauled. The brakes work perfectly, and as mentioned previously, the gears are a joy to operate. The bike also benefits from new tyres both front and rear. With the condition being as superb as it is, we imagine this example will become part of a collection, and be enjoyed for its condition and rarity, rather than the riding experience – however, we can confirm that it rides great, and certainly puts a big smile across the face. 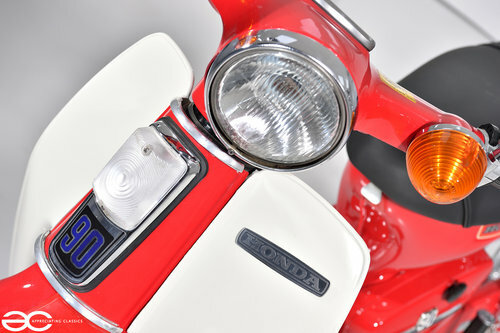 Honda Spacy Ch250, 1986, quirky, future classic!! Crazy Spacy! 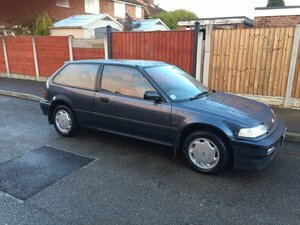 Nice condition, these are quirky classics of the future!